I noticed the oaks right away. My first visit to the Vineyard was in spring 2002 when the abundant oak trees were raining down yellow pollen. 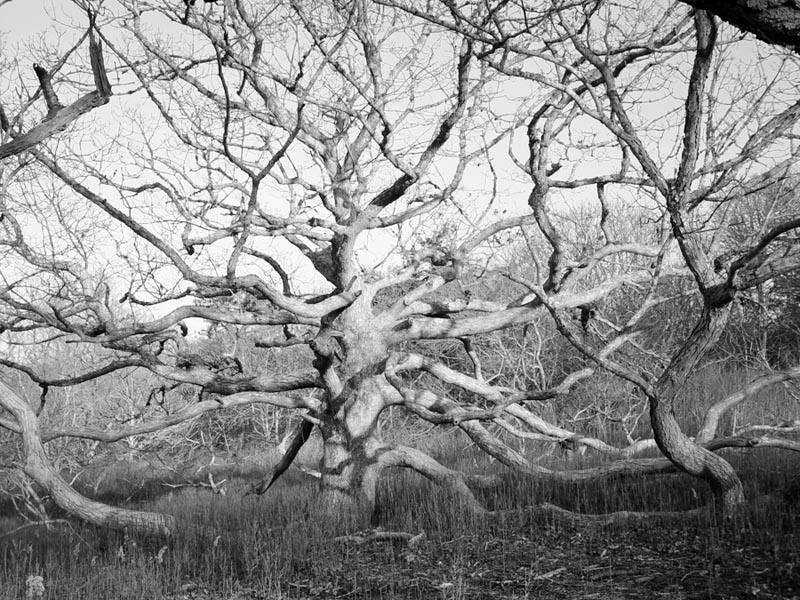 Later, after moving to the Island while my daughter was playing at the West Tisbury School playground, I wandered off into the woods to look at the trees. I was gleeful to discover five oak species, including Quercus alba, the white oak. A young mother asked why I was so excited. After I explained my love affair with oaks, and my new position at the arboretum, she gave me some input: “I hate oaks; they’re everywhere. You should get busy planting more maples!” Nonetheless, my exuberance for oak trees remains undiminished. Perhaps the most noble of the oaks, the white oak, is widespread not only throughout Martha’s Vineyard, but also throughout the eastern half of North America. It was used by Native Americans for food, medicine and other uses. In the 1600s (on Cape Cod) the Wampanoags shared the knowledge that the best time to plant corn could be determined from the size of an emerging oak leaf. The first North American colonists felt a kinship with the white oak, as it resembles the English oak (Quercus robur) of their homelands. Throughout the next 200 years of settlement, the white oak was put to innumerable uses: it was the preferred wood for homesteads, bridges, barns, furniture, baskets, barrels and ships. Ships of oak stocked with oak barrels carried Vineyarders all over the world. The light gray bark of white oak is easy to recognize in our woodlots as well as its old leaves, which are the last to shed among our native oaks in the spring. The leaves are light green and typically have five to seven narrow, rounded lobes. The post oak (Quercus stellata) is the native oak most often confused with white oak. In comparison, the shiny leaves of post oak are dark green; they have five lobes with two distinct broad lobes occurring above the middle portion of the leaf, forming a noticeable cross with the axis of the leaf. On the Vineyard, the post oak often grows in groves due to its ability to regrow after harvesting or fire. The acorns of both species are a valuable food for wildlife. Of all the oaks on the Island and native to North America, the white oak is one of the most long-lived oak species; some fantastic specimens survive over 400 years. Most of the Vineyard oak forest has been harvested again and again since European settlement. Occasionally, you will see an old-timer. A favorite tree of mine (and many others) is the impressive historic white oak at the intersection of State and North Roads in West Tisbury. Oaks give us much and ask little in return. The least we can do for them is to admire their strength and beauty, but we should also plant acorns for future generations. And yes, I agree, we should also plant more maples . . . and birches and beetlebungs and . . .
Tim Boland is executive director of the Polly Hill Arboretum.